Our choices of stopovers and activities along the route were influenced by time available, budget and style of travel preference. In our case, the trip time will be 6 weeks total, we have a moderate budget, and we enjoy primitive camping and backcountry adventure (to see detailed for any day, click thru the Day link to access the planning assets and notes for each segment). 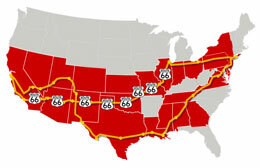 Here is the confirmed schedule and itinerary for our Great American Roadtrip 2010.